Based in Charlottetown, PE our family has been serving Prince Edward Islanders from Alberton to East Point offering high quality workmanship and service for those who are looking for dependable, professional solutions to their painting and seam filling needs for 3 generations! 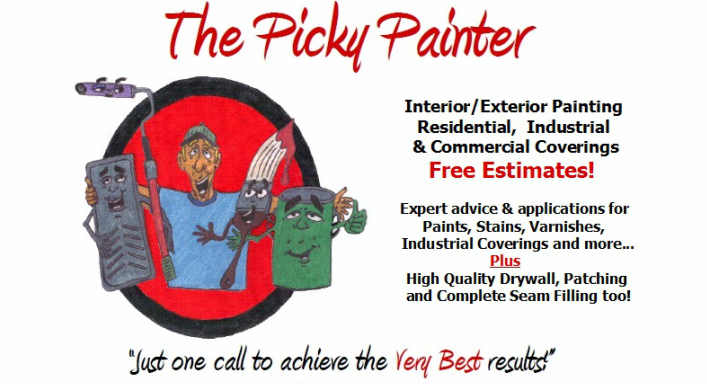 My name is Joe Madore and I am the owner/operator of The Picky Painter. My family has been beautifying Island Homes and Businesses for over 90 years, so you can rest assured we know how to leave your home or business with a look that will meet or exceed your expectations. Whether you are looking for expert application of industrial coverings, residential coverings, stains and varnishes or you need the professional touch on getting your home or business ready for paint/coverings with a high quality seam filling or patching job you've come to the right place. This company places enormous emphasis on personalized service! We keep a neat, clean and friendly atmosphere with each job - because our workplace is your workplace or home! So, for your next project, whether it might involve the need for high quality seam filling, professional application of residential or commercial coverings or both, let's make sure you get the biggest return back on your investment of time and dollars. Let's put you first with the right materials and the right people doing the job...let's make sure your project gets the professional attention it needs and you deserve! Just a sample of the interior/exterior work done pleasing Island clients! Please feel free to browse the rest of the online portfolio. If you have any questions concerning the work we do as seen in these sample pictures, be sure to contact us!